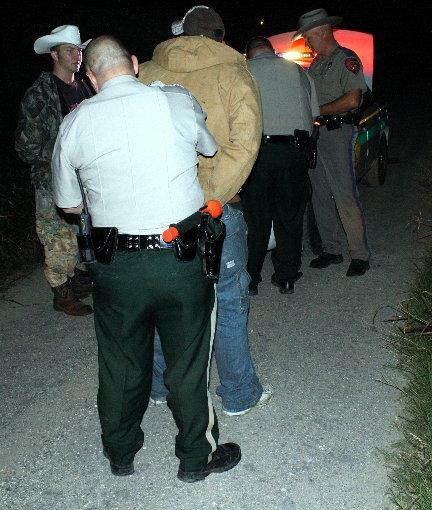 Driver Threatens, Gets Truck Stuck in Ditch, Charged With Deadly Conduct, ACE, October 19, 2009 - At approximately 10:30 pm on October 18, 2009 a green Dodge truck driven by Ernest Lee Travis, Jr, 21, of Childress was sitting in his truck with his passenger John Colbin Wright, 17, of Onalaska on a narrow unpaved road (Walters Loop) less than a mile off of FM-2610. The two were sitting in the dark with the engine off and lights off. A concerned local resident approached the truck to see what was going on. The resident questioned Travis and Wright. According to the resident the two became verbally threatening and started their truck and attempted to strike him with their truck. They missed and ran their truck into a deep ditch and were stuck. A call was placed to the Polk County Sheriff's Office and Deputy Lee Rogers and Deputy Daniel Sangster were dispatched to the scene along with DPS Trooper Kevin Burman. Upon arrival the two were detained by Burman and Rogers. Deputy Rogers opened up an immediate investigation into the incident. 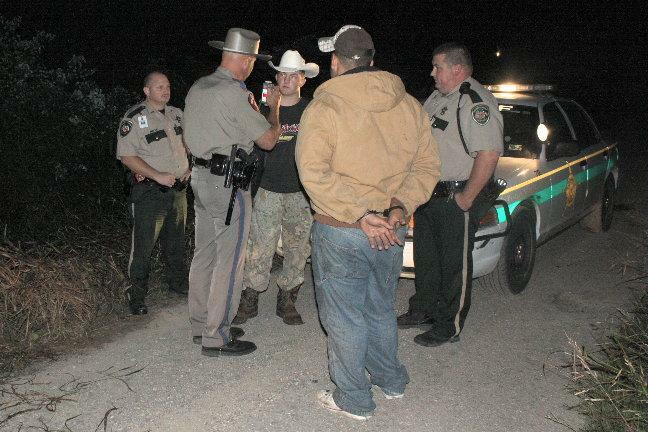 In addition it was determined by Trooper Burman and Deputy Rogers that Wright was intoxicated. Upon completion of the investigation both were arrested and taken to Polk County Jail and booked in. Ernest Lee Travis, Jr. was charged with deadly conduct and John Colbin Wright was charged with public intoxication. 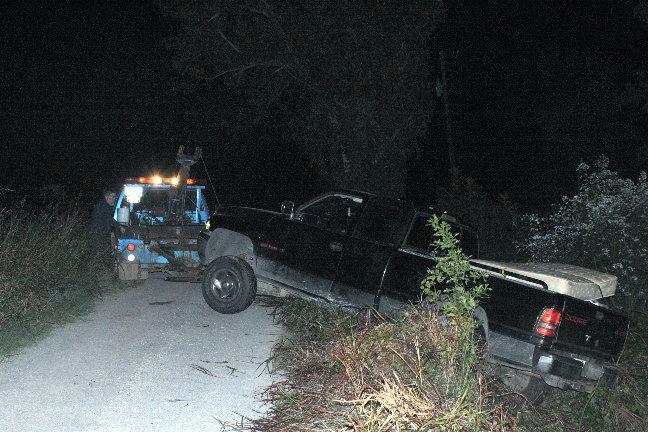 A wrecker from Harwood Wrecker Service recovered the truck from the ditch and it will be stored at 101 Harwood Drive in Livingston. The scene was cleared shortly after 1 am. 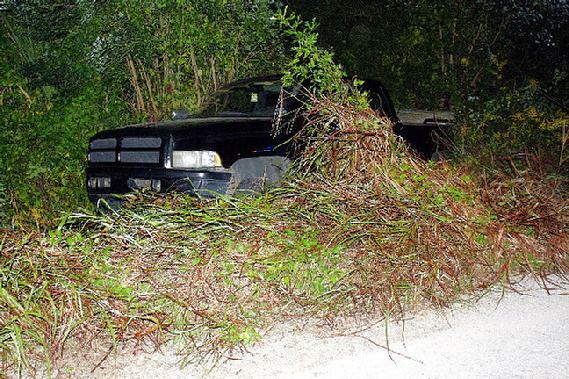 Editor's Note: There was allegedly a third person in the truck that got away on foot before law enforcement arrived and is being sought by local law enforcement. 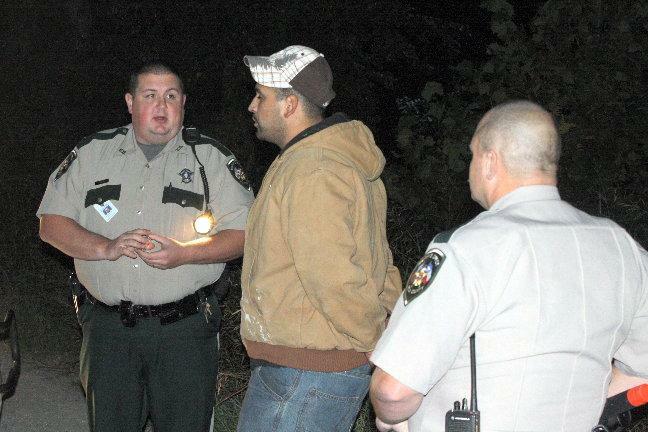 Deputy Lee Rogers (Left) opened up an immediate investigation into the incident. Deputy Daniel Sangster looks on. 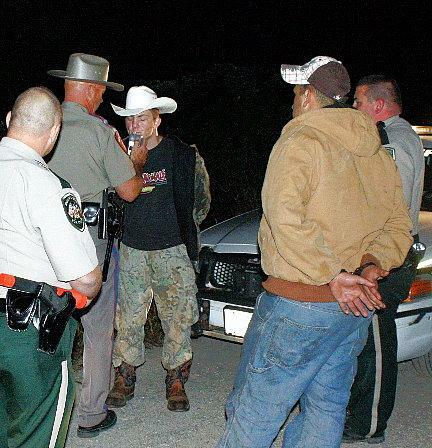 Ernest Lee Travis, Jr. (Center) was charged with deadly conduct. Both suspects were placed under arrest. 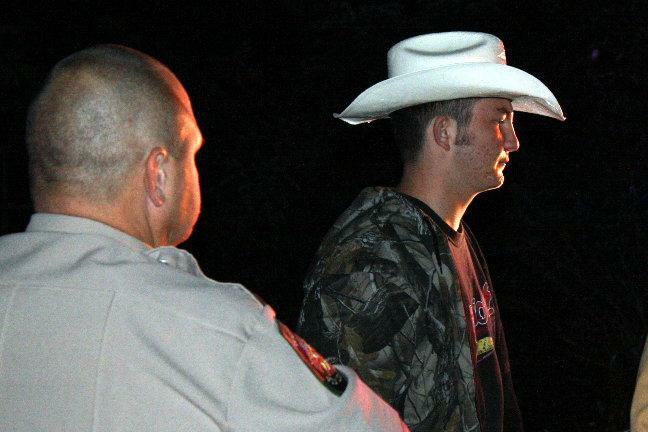 A breathalyzer test showed that John Colbin Wright, 17, of Childress, was legally intoxicated. Vehicle Recovery Specialist Jim Harwood recoverd the ditched truck.